﻿ Software - Telonics FP-100 Toolbox | Telonics Inc. 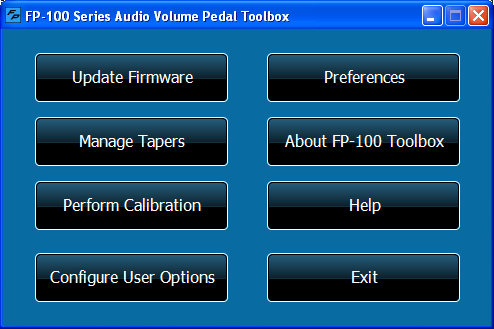 The Telonics FP-100 Toolbox is a suite of programs that allows you to maintain your FP-100 Audio Volume Pedal. With this software suite, you will be able to update the firmware (microcontroller executable code), perform calibration, manage tapers, and set user options. Displays the firmware version currently in the microcontroller. Downloads new firmware files from the Telonics web server. Programs the new firmware into the FP-100 microcontroller. Calibrates the toe-down treadle position. Calibrates the heel-down treadle position. Calibrates the internal amplifier gain offset. Displays the tapers currently programmed in each taper slot. Downloads new taper files from the Telonics web server. Restores stock tapers and minimum level settings. Sets the LED on/off option. Sets the taper normal/reversed option. Sets expression output voltage profile (for units that are so equipped). Cable: USB "A" to 5-pin "Mini-B"
Download the installer from this page. Save the installer in a convenient place on your hard drive, such as the Windows desktop. Download the Driver Installation Instructions and save in a convenient place on your hard drive. Familiarize yourself with the Driver Installation Instructions. You will need Adobe Acrobat Reader to view the file. Start the installer by double-clicking the program icon. In order to use the FP-100 Toolbox, you will have to enter an authorization code. You can obtain an authorization code by contacting Telonics at (480) 892-4444 or via email: info@telonics.com. The authorization code is free of charge, however you will have to provide a valid FP-100 serial number. To enter the authorization code, start the program and follow the directions provided by the help system. Prior to performing FP-100 maintenance, please familiarize yourself with program usage. The help system contents may be displayed by clicking the help button in the FP-100 Toolbox opening screen. Calibration Tool: Added a page to calibrate the FP-100 default minimum level setting. This enhancement currently applies only to FP-100s using F5161205 and future F5 firmware. Taper Management Tool: Improved the Set Factory Defaults process. Default taper minimum levels are set more accurately than in previous versions. Help system: Updated to include information about the new calibration page. Installer: The latest F2 and F5 firmware files are now included during the program installation. Eliminated support for Windows 2000. Added support for Windows 8 and Windows 10. Updated the digital signatures applied to the installer and executable files to ensure a smooth and problem-free user experience. Corrected a bug in the Firmware Update Tool. The tool was unable to load and program the latest generation F5 firmware files. In the Taper Management Tool, changed the handling for tapers 6, 7, and 8. These tapers are now considered default tapers and are restored (with minimum level settings at -65 dB) when the Set Factory Defaults button is clicked. New firmware files were added to the installation. Corrected a bug in the taper file downloader. New tapers were added to the installation. The help system received some minor additions. Added support for the new "F5" FP-100 firmware. Added support for the new "F3" and "F4" FP-100 firmware. Updated the FP-100 USB driver in order to avoid a situation in which the FP-100 Toolbox installation freezes while USB driver files are being copied to the computer. Note that this incompatibility has been observed on computer systems running Windows XP and certain brands of anti-virus software such as Kaspersky and COMODO. Corrected support for computers running Windows 2000. Note that if your computer is running Windows 2000, Service Pack 4 (SP4) is required. Minor improvements were made to the user interface in the Firmware Update applet. In the taper management tool, corrected a message indicating that a firmware upgrade is required. Improved the auto-correct capabilities of the authorization code entry mechanism. In the Firmware Update tool, improved page 2 summary text. In the Firmware Update tool, added help buttons on pages 2 and 3. In the Taper Management tool, added a help button on page 2. In the Calibration tool, added help buttons on pages 2, 3 and 4. In the User Options tool, added a help button on page 2. Corrected the Firmware Update Tool and User Option Tool to properly support FP-100s with "F2" firmware, which ships in all new FP-100s capable of providing the expression output feature. Added a program overview screen following display of the splash (logo) screen. The overview contains a checkbox control so that subsequent display can be disabled. Added controls in the Preferences dialog to allow any of the tool "reminders" (including the program overview) to be re-enabled. Reminders are placed in the various tools to provide "nice-to-know" information and include a check box that when checked, disables subsequent display. Modified the Firmware Update Tool web downloader to download any firmware file on the Telonics web server that does not currently reside on the user's computer. Modified the FP-100 Toolbox setup program to install all available firmware files (those existing when the setup program was created) onto the user's computer. Modified the Firmware Update Tool and Taper Management Tool to be more intuitive and user-friendly. Modified the Taper Management Tool to show all taper files currently residing on the user's computer. The files are shown on page 2 of the tool, before entry to page 3, where taper management is performed. Modified the help system to reflect the above changes.